If you've visited Burlington Beer in Williston within the last month, you might have noticed the new 30-foot-tall mural depicting a pair of hands, partially obscured by a canning apparatus, rising up toward the ceiling. Depending on your perspective, they're either about to catch, or have just released, a bee the size of a dishwasher. Behind the hands looms a forest of birch trees, the whorls abstracted into eyes that hover in mid-air. Below, the roots extend all the way to the floor, interspersed with circles. Are they rocks? Bubbles? Portals to another dimension? According to 22-year-old artist Sunniva Dutcher, that's for the viewer to decide. When Dutcher began to tackle the 550-square-foot wall last month, she had never attempted anything on that scale before. But it wasn't her first work of art at Burlington Beer. 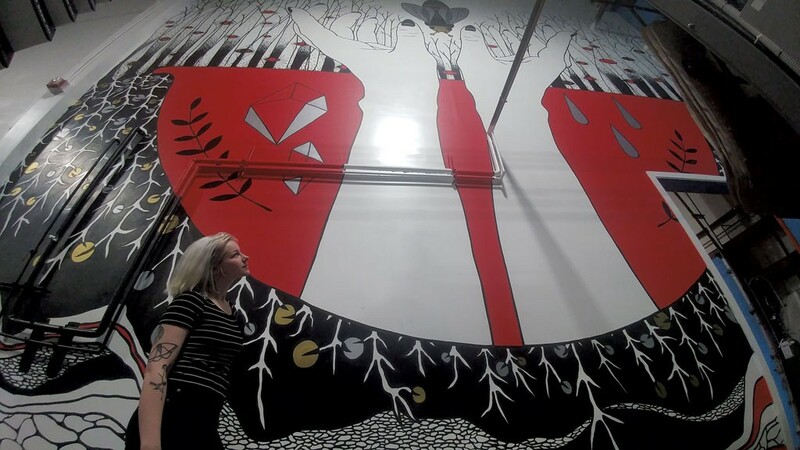 Since 2014, owner Joe Lemnah has commissioned her to create several other murals, including a hyper-detailed forest scene in the bathroom featuring fungi worthy of Alice's Adventures in Wonderland and a kaleidoscopic swirl of geometric shapes in the corridor between the tap room and the brewing facility. Lemnah was not available for comment. For her latest project, Dutcher worked from a smaller sketch, using a grid to keep the hands proportional — which, she pointed out, are hard enough to get right in a life-size drawing. In total, the mural took about 27 hours to complete. "This project has been so challenging, but in a really good way: It's a physical stretch as well as an artistic one," she said. Before Dutcher started doing Burlington Beer's murals, she tended toward the microscopic, drawing delicate pen-and-ink illustrations on tiny squares of paper. Working bigger has allowed her to experiment with a looser style, although her aesthetic has remained consistent: Picture a psychedelic tarot universe of echoing geometric designs and intricate line work, plus the odd disembodied eye. Dutcher got her foot in the door at Burlington Beer about four years ago, when she was working at Natural Provisions Market in Williston. She did the lettering for the store's chalkboard signs, and her work caught Lemnah's eye. He invited her to create signage for the brewery, then offered her the chance to paint a mural in the bathroom. Dutcher noted the synergy between her visual vernacular and the clean, geometric lines of Steve McDonald, the artist responsible for Burlington Beer's distinctive beer can labels. "I think that's part of what's so cool about working in this space," she said. "There's this common visual language that people recognize when they walk in, and it makes everything look coherent." Like Lemnah, Dutcher is a native Vermonter. She grew up in Jericho, also home to fellow muralist Mary Lacy, who painted the 28-foot-tall hummingbird on the building housing Burlington's Monarch & the Milkweed and the 32-foot-tall silos outside the Pine Street headquarters of Dealer.com. Dutcher's parents are artists, too: Her mother used to be a graphic designer for Americade, a weeklong motorcycle rally held each summer in Lake George, N.Y.; her father, a Spanish teacher by day, is a largely self-taught woodworker. Dutcher, whose first name means "gift of the sun" in Norwegian, has been painting and crafting since she can remember. After graduating from Mount Mansfield Union High School, she rented a studio at the S.P.A.C.E Gallery in Burlington and committed to being a full-time artist. She now lives and works in Jericho, where she recently monopolized her parents' garage to create a 6-foot-tall sculpture made of packing tape in the shape of a quartz crystal. While her materials may be thoroughly modern, Dutcher gravitates toward a more primitive relationship with the natural world. On her right arm, she has a tattoo of two birds perched on a twig, an illustration taken from a mid-19th-century book she found in her grandmother's attic called Nimrod's Survival Guide. Recently, Dutcher learned how to work soapstone and build a bow and arrow during a nine-month course at the Roots School in Bradford, a survivalist mecca whose motto is "Bringing you the Stone Age since 2007." Last fall, she led a knitting workshop at the school's Roots Rendezvous, an annual shindig in which attendees learn how to weave baskets, track game, make herbal poultices and generally channel their inner nomadic hunter-gatherer. For Dutcher's next project, she's hoping to work on an outdoor mural, continuing her pursuit of nature. This month, she's launching an exhibition of her paintings, drawings and felted creations at Burlington Beer; it will be on view from January 13 through February 7. On a recent Thursday night, a group of bros visiting the brewery from Saratoga Springs, N.Y., paused their game of Trivial Pursuit to admire Dutcher's work. "It's pretty killer," said one. "Agreed," chimed in another. "Also, that bee is sick. Without bees, there'd, like, be no beer." Learn more at sunnivadutcher.com. Sunniva Dutcher's murals are at Burlington Beer, 25 Omega Drive, Suite 150, in Williston. Additional works are on view January 13 through February 7.